The outline is provided below. You will learn the essential concepts and terminology of version control, Git, GitHub and GitHub desktop. This tutorial follows a learn-by-doing approach. It covers a variety of topics that could each be its own book. There are a plethora of online resources available for everything covered here but you can't Google something if you don't know what you're looking for in the first place. The main difference here is that we don't use the terminal (or command line) and provide screenshots for every step. 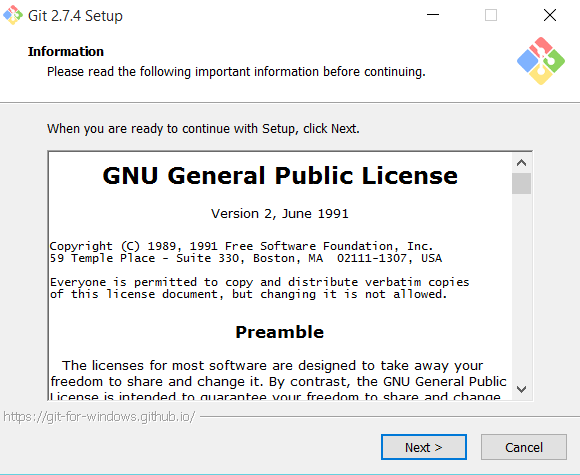 Once you have read the GNU General Public License (this is not required to continue) click on Next. 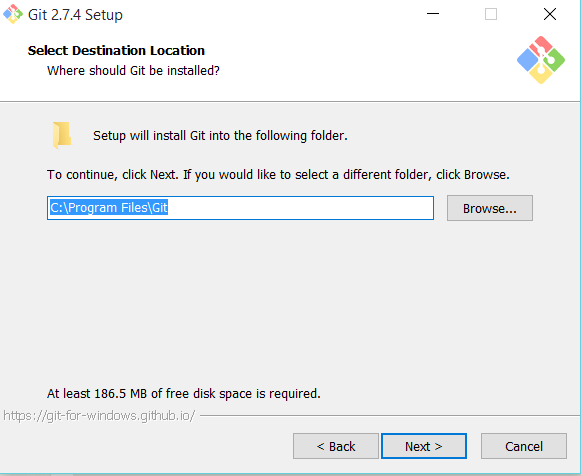 You need to select where you want Git installed. I have chosen the default location Program Files, but you can change this if you like by clicking on the Browse... button. Once you have chosen a location click Next. 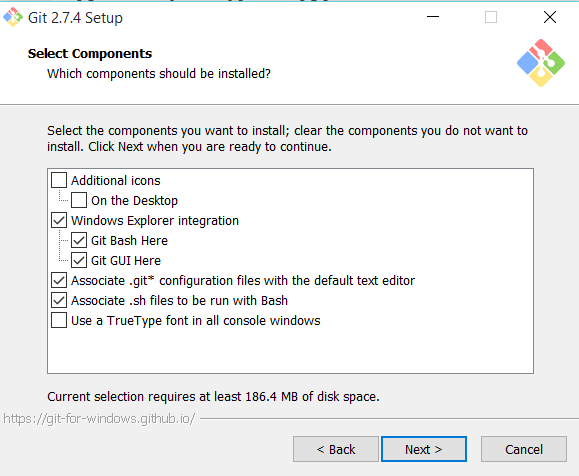 Select the components you want to install. Ensure that at least the boxes shown in the screenshot below have been checked. Click Next. This step is to select where you want the shortcut location to be stored. I have chosen the default. Then click Next. 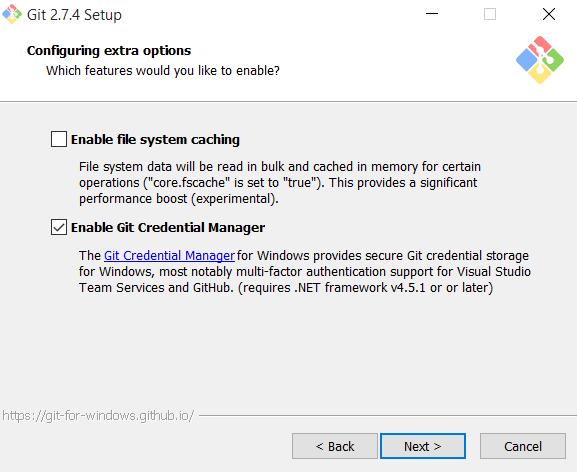 Ensure that at least the Enable Git Credential Manager box is checked, and click Next. You should see now see the following installation screen. The following screen will appear once the Git setup has successfully completed. Click on Finish. Well done, you have installed Git on your system. Proceed to Chapter 2 to signup for a GitHub account. In this short Chapter, you will signup for a GitHub account. GitHub is like your online portfolio of code. It has a plethora of great features for creating websites, project pages and collaborating with others. 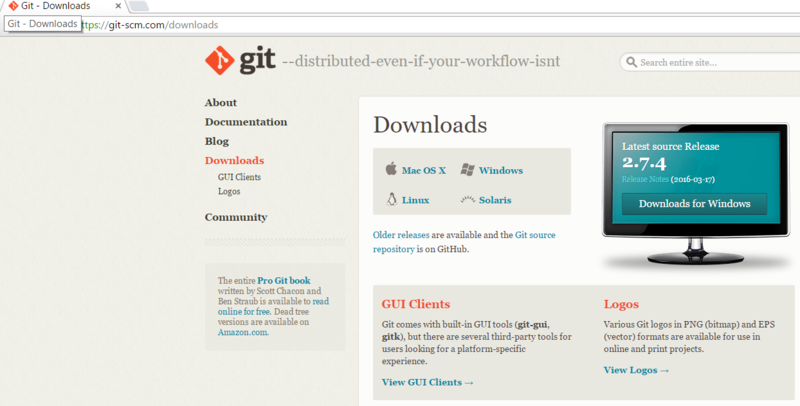 Again GitHub is an interface to the version control system called Git. Other options include Bitbucket and GitLab. The longest step in this chapter is choosing your username. Think about it carefully and ensure that its professional; it will be how you are recognized on the internet, i.e., your github website address will be github.com/username. 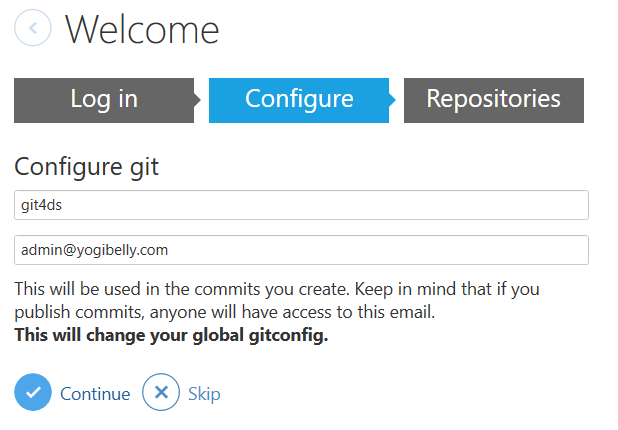 Once you have chosen a username, enter a valid email address and password, and click on the Sign up for GitHub button. Choose the free plan (default) and click on the Finish sign up button. Well done. You now have a GitHub account. 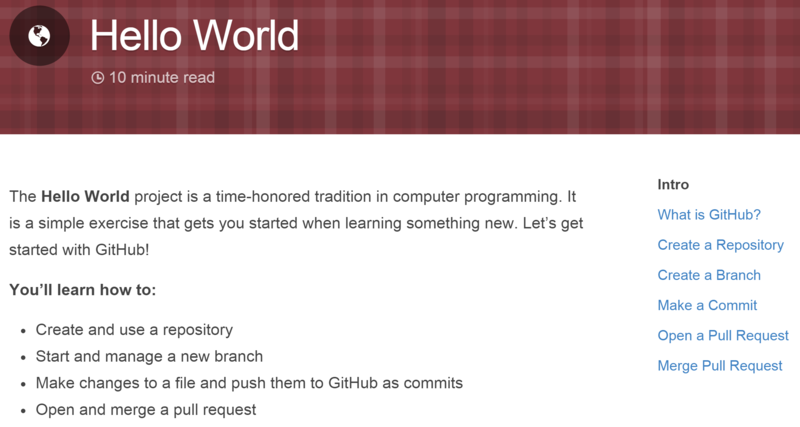 Complete the Hello World guide which will walk you through some functionalities of GitHub. Click on the Let's get started! button. 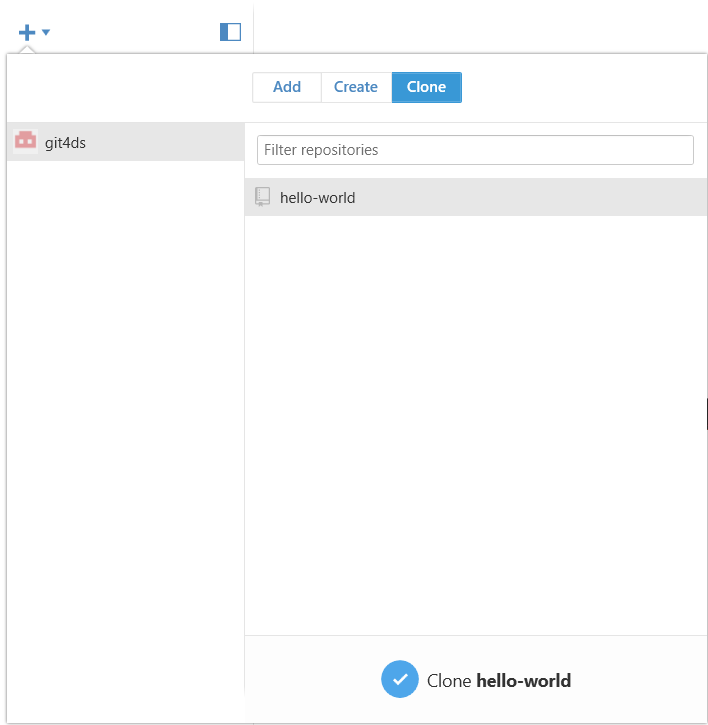 Complete the exercises in the Hello World tutorial and move on to Chapter 3: Installing GitHub Desktop. 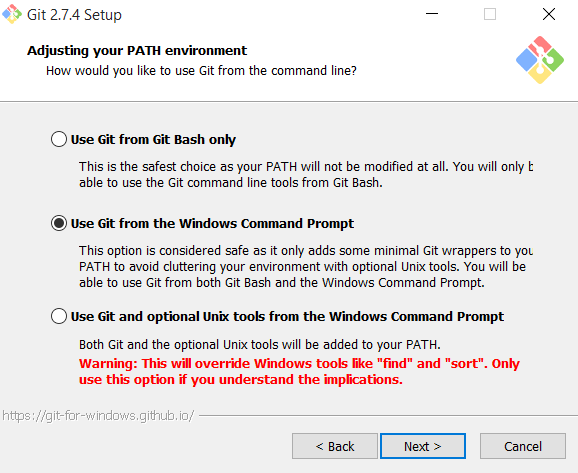 Traditionally, version control with Git is accessed through the command line or terminal. 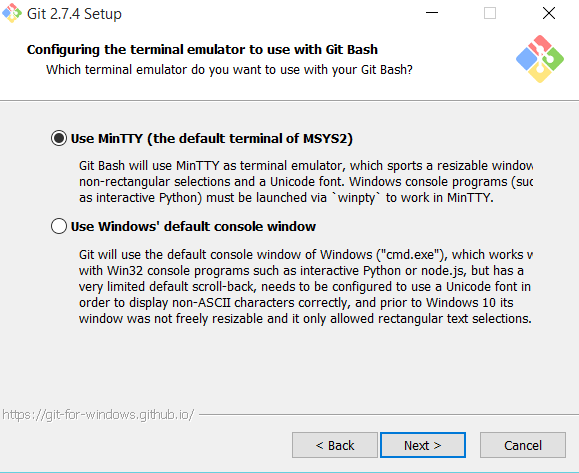 GitHub Desktop is a software program that makes it easier to use Git functions without having to use the command line. It also allows you to communicate with your GitHub website (github.com/username). 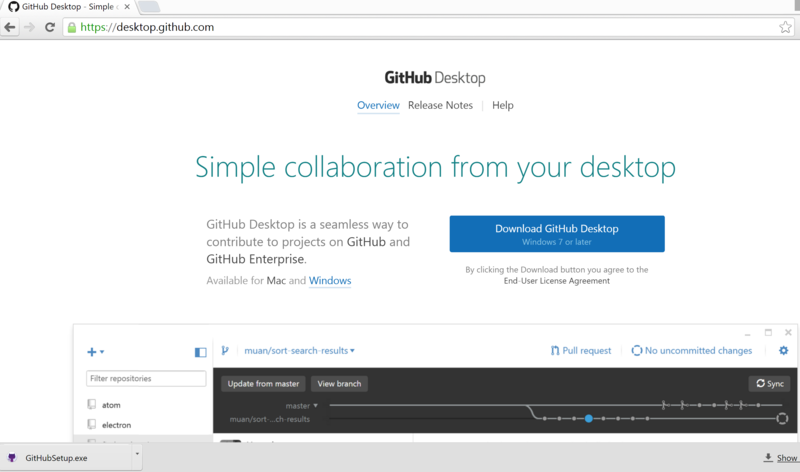 Don't worry if the differences between Git, GitHub and GitHub Desktop are not clear to you yet. You will have a better understanding once you have completed this tutorial. Note: in all the screenshots that follow, my username is shown, however you should be entering your username, password and email address created in Chapter 2. Go to https://desktop.github.com/ and click on Download GitHub Desktop. 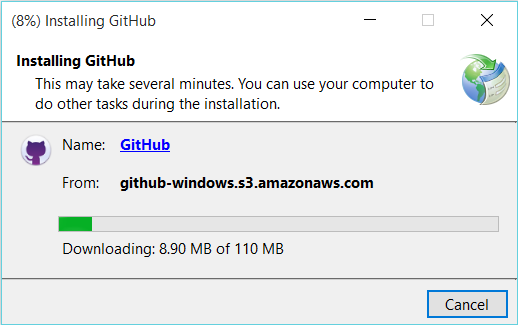 Note: GitHub desktop is only available for Windows and Mac. If you are running Linux I recommend GitKraken. 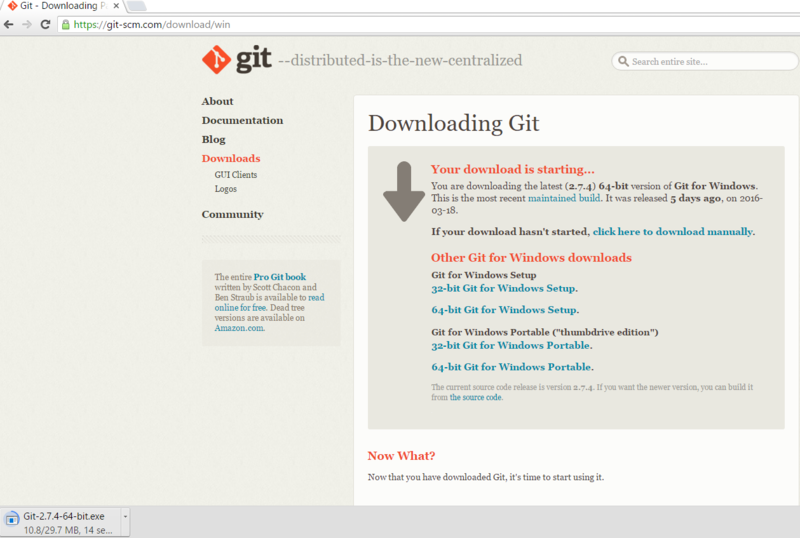 Once the program has finished downloading, click on GitHubSetup.exe (or .dmg on a Mac). 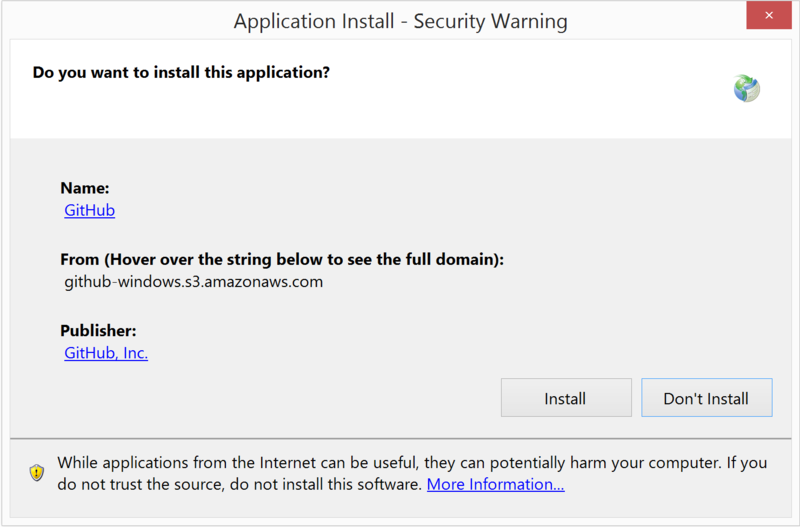 You should see this installation screen. Once installed, open up the program and login using the GitHub username and password you created in Chapter 2 and click on Log in. This information is used to identify the person that made the changes to your code. Leave the default values and click on Continue. 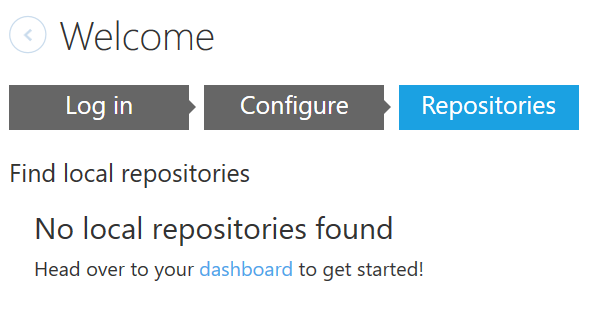 You should see this screen, since you haven't created any local repositories yet. What is a repository? 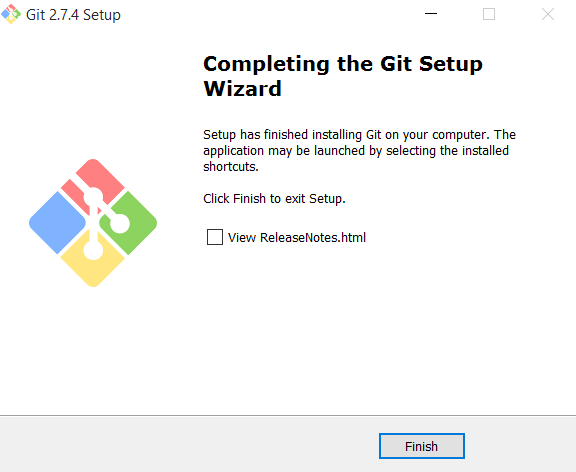 The purpose of Git is to manage a project, or a set of files, as they change over time. Git stores this information in a data structure called a repository (reference). You should now be at this screen. Click on the button in the top left corner. Your username should appear with a list of your repositories that are currently saved in your online GitHub account. 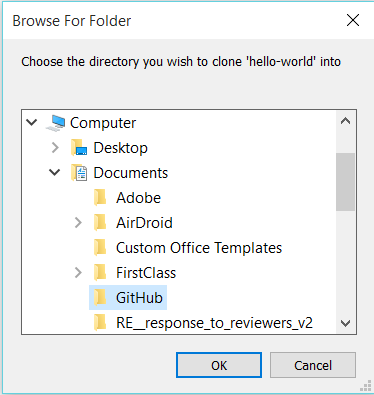 To be able to have a local copy of this repository (by local I mean on your computer hard drive) click on the Clone tab and then the Clone hello-world button (I am assuming that you completed the Hello World tutorial in Step 5 of Chapter 2). Choose where you want to save a local copy of the Hello World repository and click OK.
You should now see the following contents in your GitHub desktop program. Using your computer's file explorer (e.g. 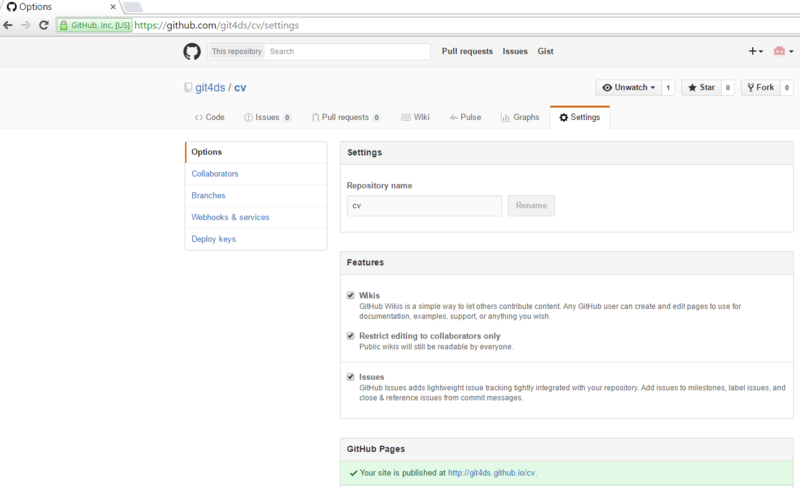 windows explorer or mac finder), locate the local GitHub repository. 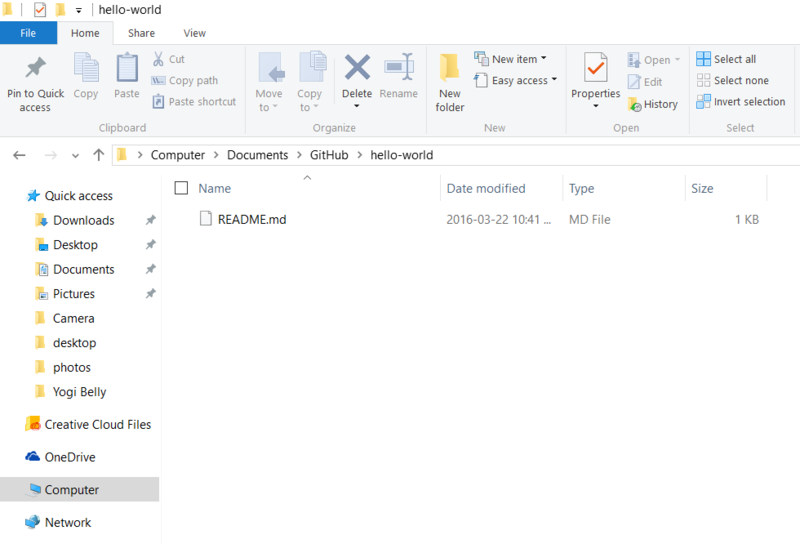 If you successfully cloned your repository you will see a hello-world folder with a README.md file in it, which is the same one you created during the Hello World exercise in Chapter 2. 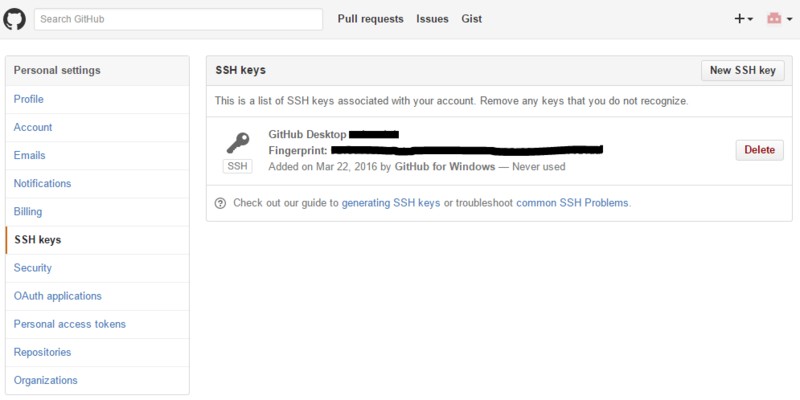 Before moving on to Chapter 4, verify that the GitHub Desktop has added an SSH key for you. An SSH key is used to establish a secure connection between your computer and the online GitHub server. On the far top right hand side of your online GitHub account click on the icon and navigate to Settings. You should see one entry in the SSH keys panel. Well done. 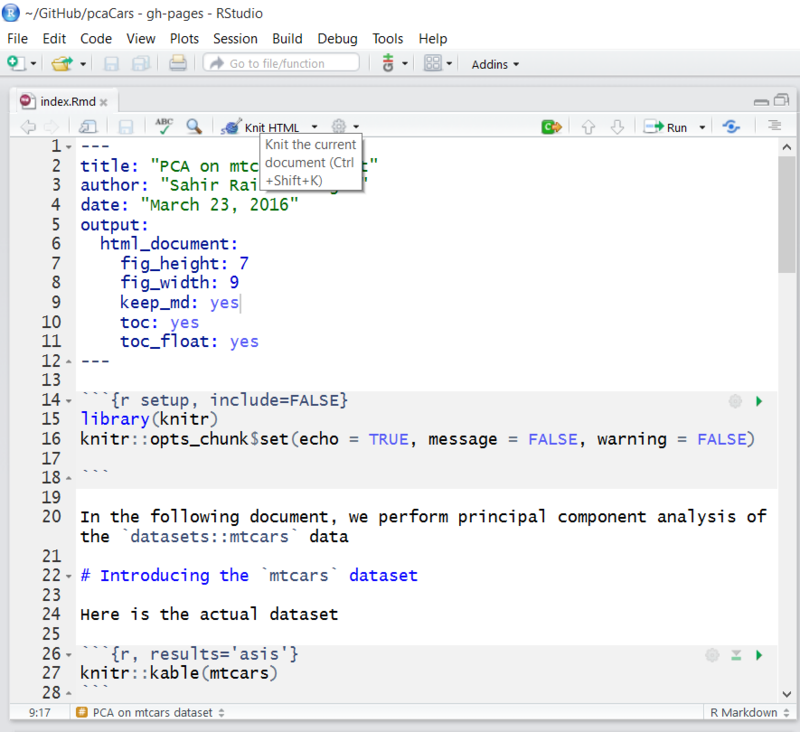 You are now ready to version control some R code in Chapter 4. 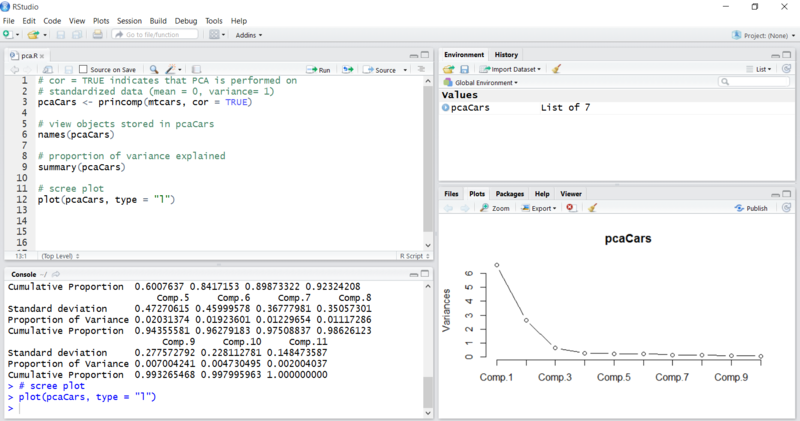 In this chapter we will learn how to version control R code using an example of Principal Component Analysis. 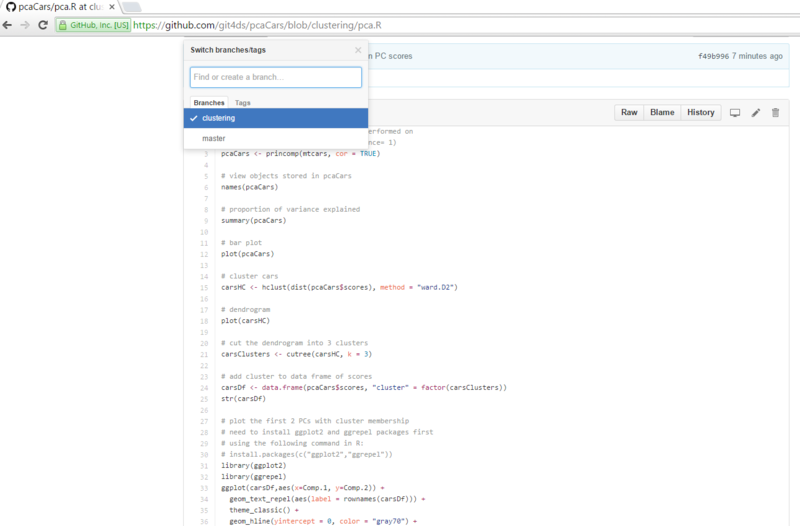 Create a local (meaning on your computer) repository by clickling the button in the top left corner of GitHub Desktop, and select the Create tab. Name the repository pcaCars and select where you want this repository stored on your computer. 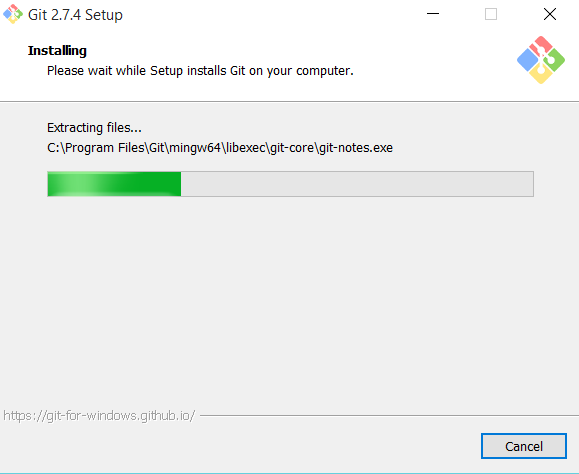 Leave the Git ignore value at its default (we will ignore what this is for now). Click on . You should see the following in your GitHub Desktop. 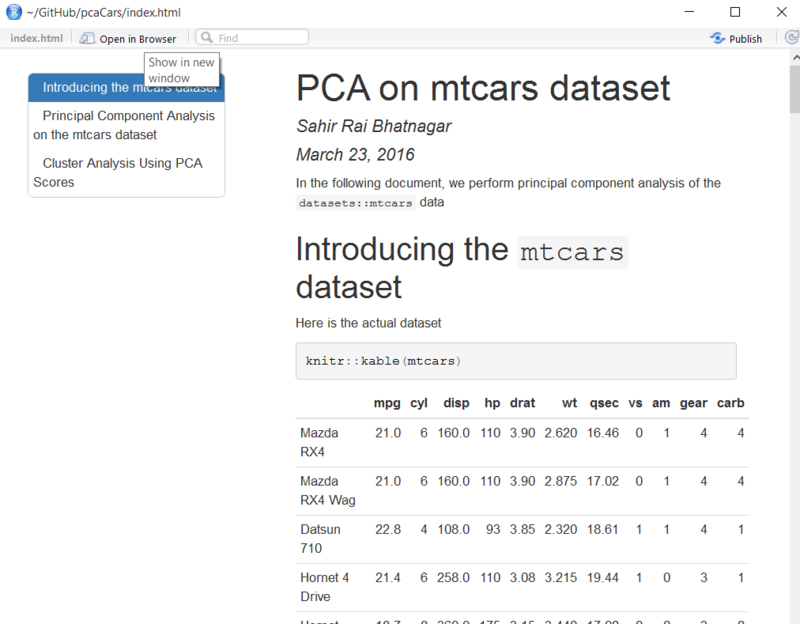 A repository called pcaCars has been created locally on your computer, and it contains two text files that were automatically created by the software. You can click on them to see their contents. The most important of the two is the .gitignore file. 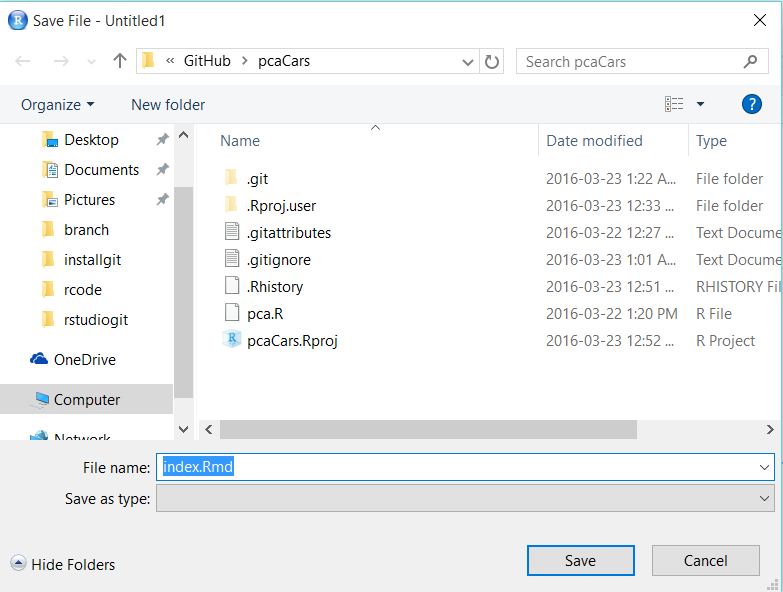 This text file allows you to control what you want to version control within the pcaCars repository. We now want to publish this repository to the remote (i.e. github.com/username). Simply click on the button in the top right hand corner. Add a description and click on . Head over to your online github account (e.g. 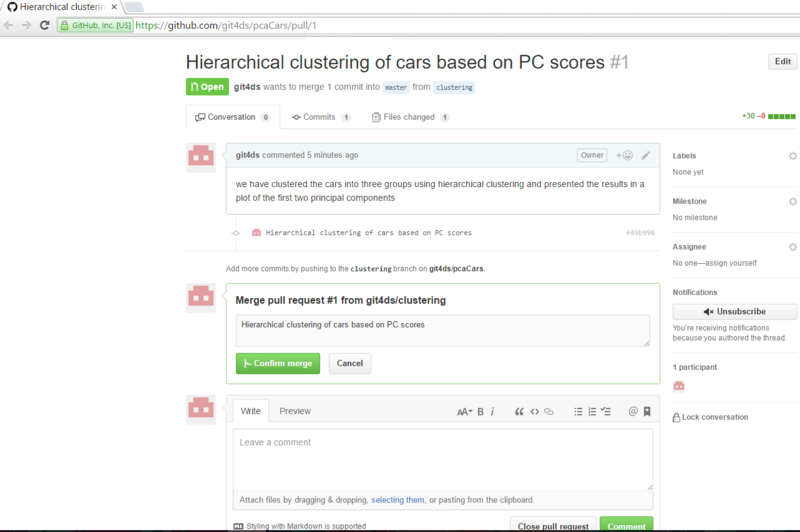 https://github.com/git4ds). You should see the pcaCars repository along with the description you entered in the previous step. 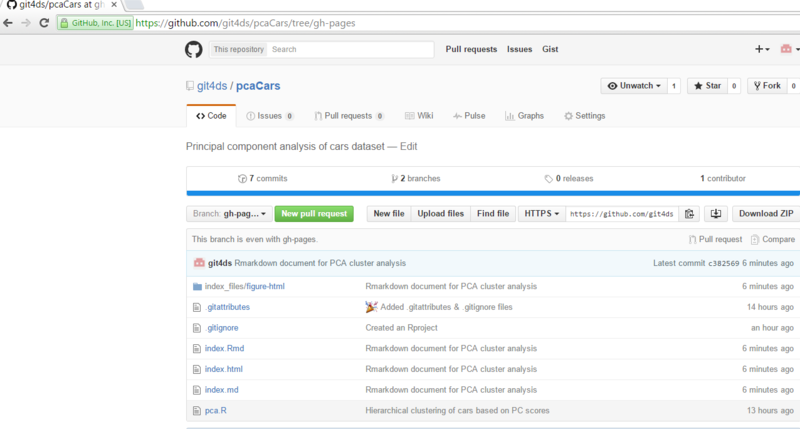 Click on the pcaCars repository and you will see the .gitattributes and .gitignore files which are the same ones you have in your local repository. Go back to GitHub Desktop. 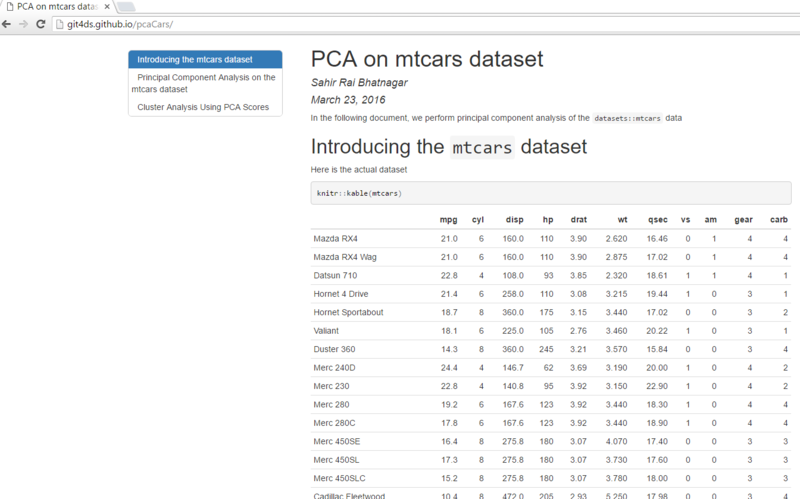 You will see the pca.R file appear. Click on the checkbox to the left of it, and you will see all the additions you have made to the file. On the bottom left hand side, enter a summary of the changes you have made to the repository and an (optional) description. Then click on . This is essentially telling Git to record the changes you have made and store them in a branch. We will learn about branches in Chapter 5. You should see the following screen. You should notice that in the rectangular black box, underneath the button, a timeline. As you commit additional changes, this timeline will grow. Each circle represents a snapshot of the repository at the time of the commit. This is the power of version controlling with Git. You can see what changes you have made, and even revert back to snapshot you want. 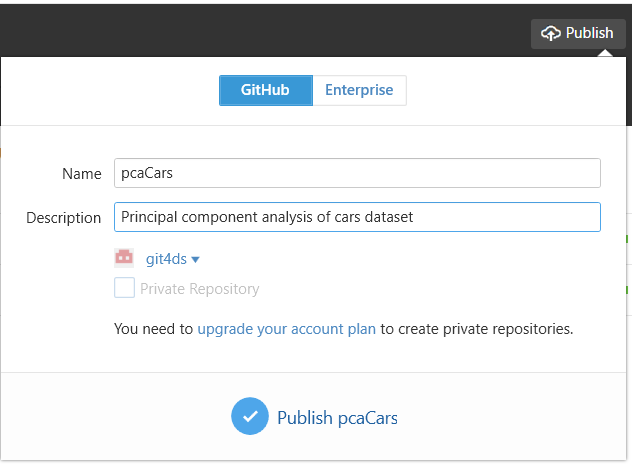 Go to the pcaCars repository in your online GitHub account. 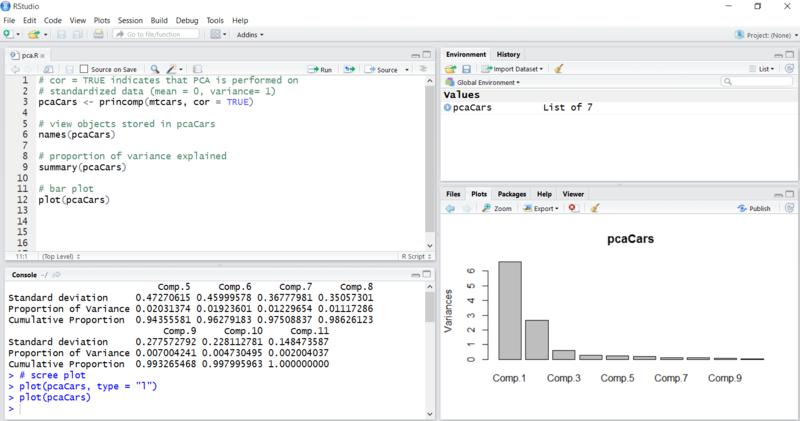 Do you see the file you just created called pca.R ? Why not? Because the commit you made was local to your computer. In order to see these changes online, you must push your local changes to the remote. Go to GitHub Desktop and click on the button in the top right hand corner. 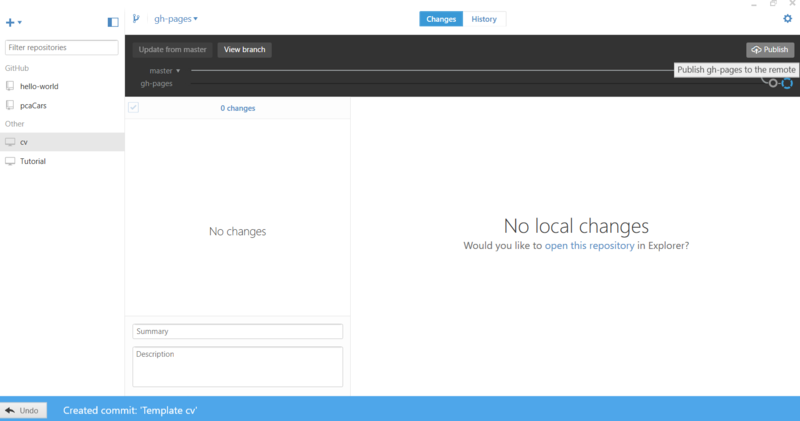 You should now see your local changes pushed to your online repository. Your script should now match what is shown in the screenshot below. 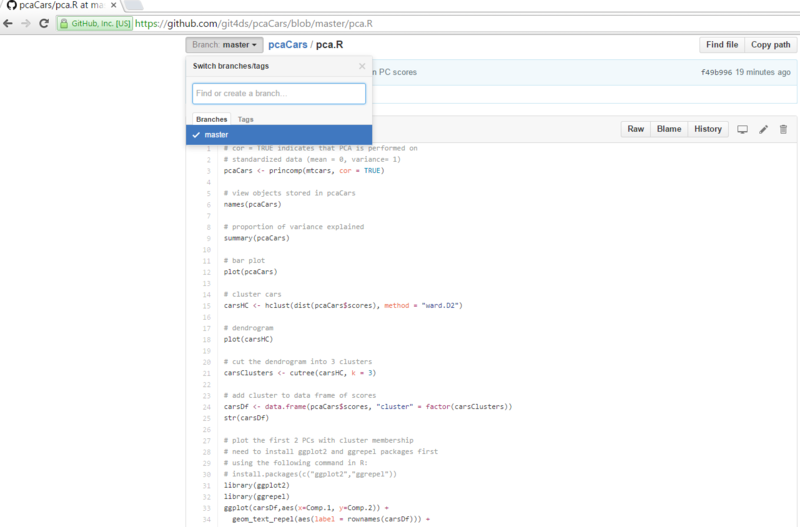 Go to GitHub Desktop and click on the pca.R file. 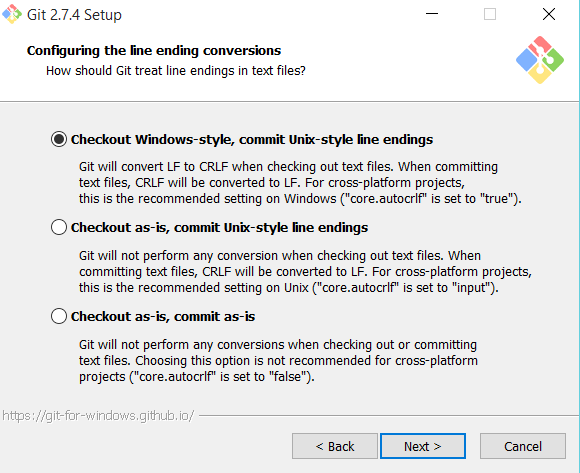 You will see that Git automatically recognizes the changes you have made. Highlighted in red is what has been removed from the file, and in green is what was added. 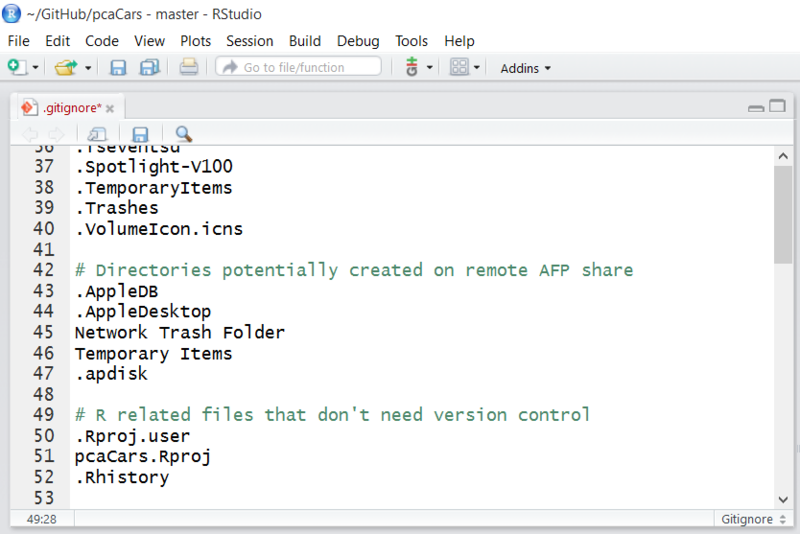 Push your local changes to the remote repository by clicking on the button. You can view the different commits you have made in GitHub Desktop by clicking on the grey circles in the timeline located in the rectangular black box. Go to your GitHub account online to see that the changes have been updated. Click on the History button located in to see a list of commits you have made to the repository. The History of commits you have made to the repository. When you have a new idea, or want to test out some existing method but don't want to modify your working script, then creating a branch is what you should do. A branch represents an independent line of development. 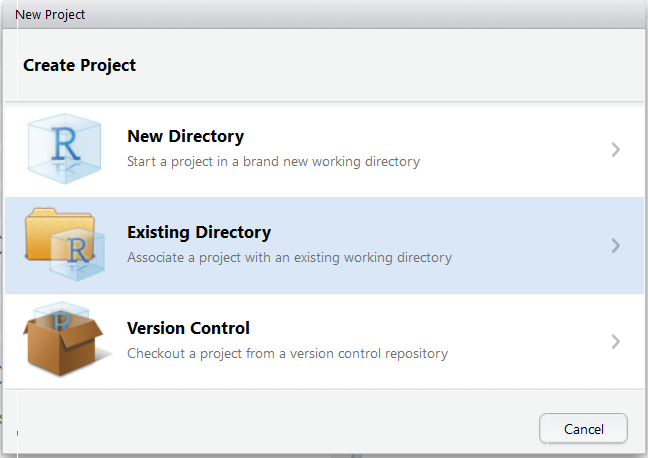 You can think of them as a way to request a brand new working directory (reference). Click on the branch symbol and name the branch clustering. 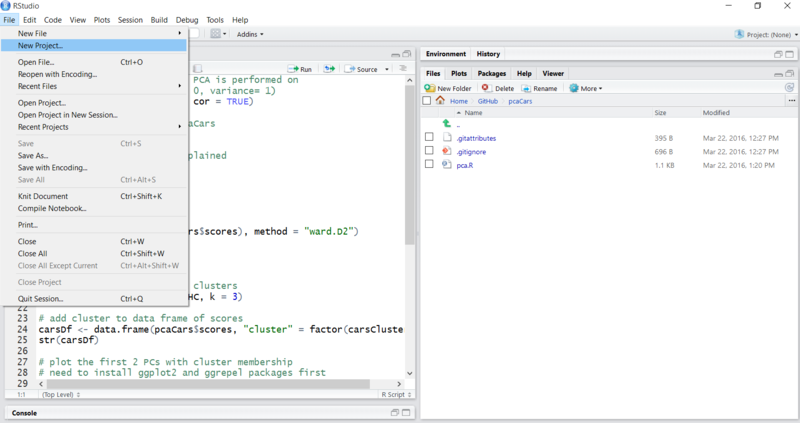 The From branch entry indicates what the starting point of the clustering branch should be (you will see what this means shortly). Since there are no other branches present, master is chosen by default. Click on . You have now switched to the clustering branch. Notice the second timeline labelled clustering underneath the master in the black rectangular box. You will also see a list of branches in this repository in the dropdown list next to the branch symbol . The checkmark indicates the branch you are currently on. Go to GitHub Desktop, click on the pca.R file and you will see the changes made have been highlighted. Describe the changes you have made and then click on . 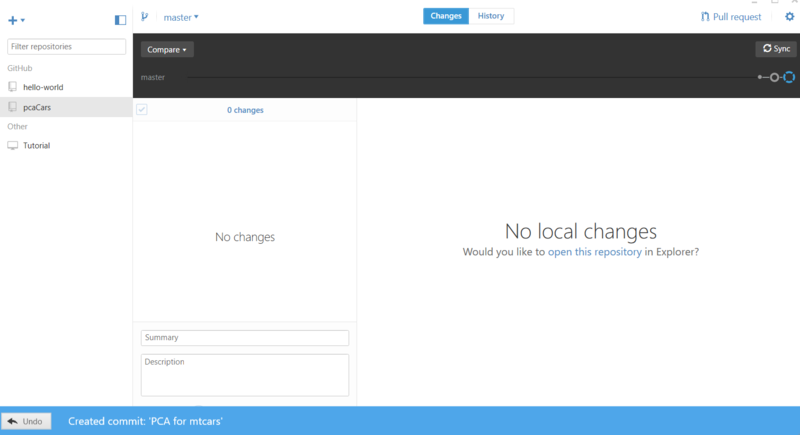 Push your local change to your online GitHub repository (i.e. the remote) by clicking on the button. You will see the clustering branch appear in the Branch dropdown menu. 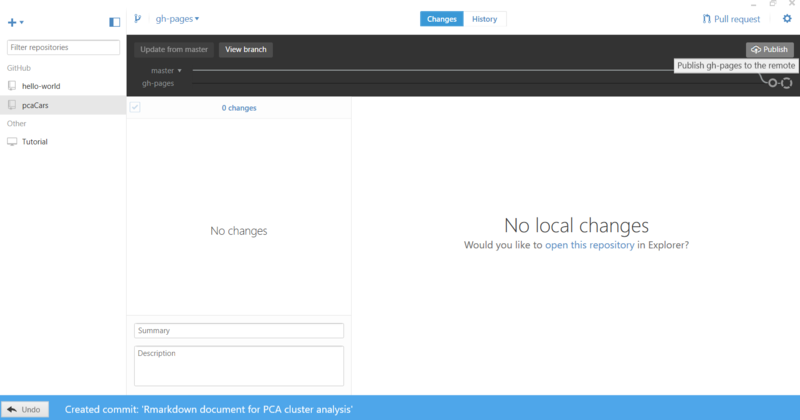 Select the clustering branch and confirm that your changes to the pca.R script are there. Switch back to the master branch. Why isn't the clutering code there? Because you commit your changes to the clustering branch and not the master branch. It should become a little more clear now what branching is and it's utility. 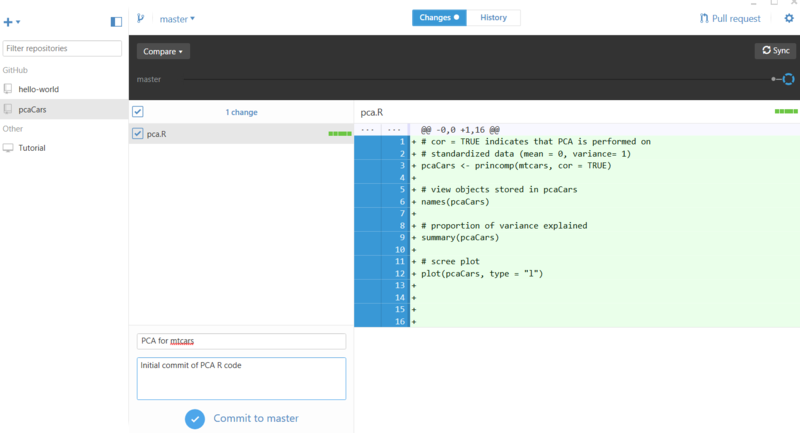 If you're content with the clustering results, it's time to merge the clustering code which is sitting on the clustering branch with the PCA code on the master branch. This is accomplished via a pull request. 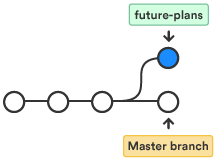 A pull request is the first step in merging two branches. 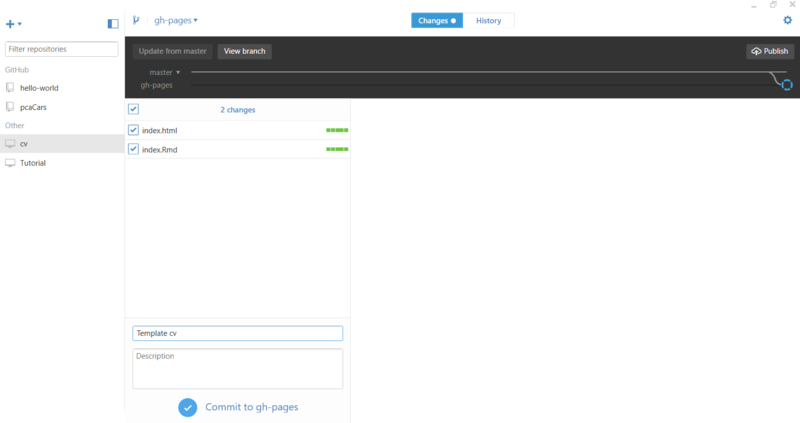 It tells GitHub that you have committed changes to the repository and allows you to review the changes. Note: pull requests are a GitHub functionality and is not part of Git. Click on the button in GitHub Desktop, enter a summary and description of the proposed changes and why you did them. Then click on . Click on View it on GitHub. 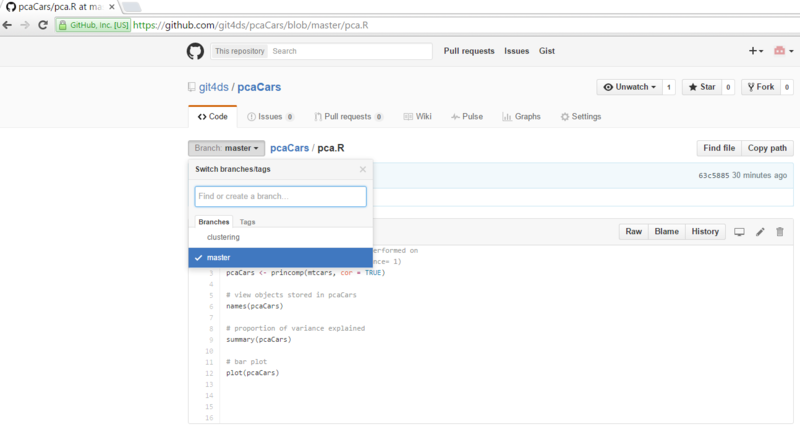 This will open the submitted pull request in the pcaCars repository of your online GitHub account. 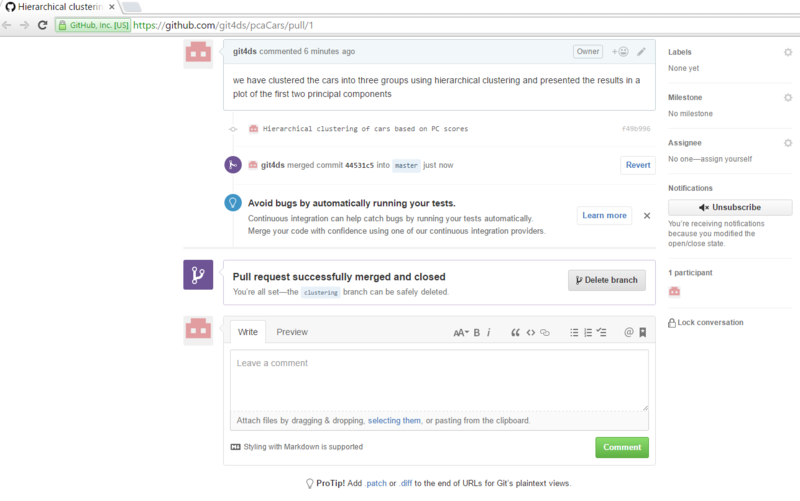 GitHub will automatically check that the merge can be completed without any conflicts. If there are no conflicts you will see the following screen. Click on . Enter a comment about the pull request (optional) and click on . Well done. You have successfully created a branch, submitted a pull request and merged your changes from the clustering branch to the master branch. You can delete the clustering branch by clicking on as it is no longer needed because these changes are now in the master branch. In the Branch dropdown list you will only see the master branch. 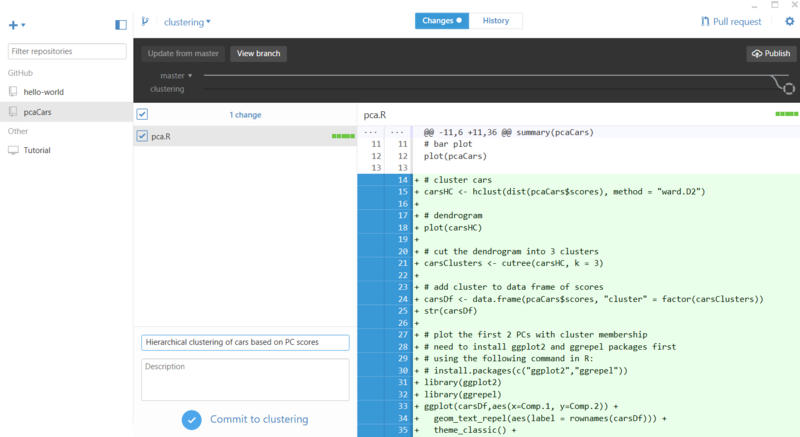 You will also notice that the clustering code has been merged with the PCA code. The merge was done online. We now want to see these changes reflected on our computer (i.e. locally). To do this, go to GitHub Desktop and click on the button. You will now only see the master branch in both the dropdown list and the black rectangular box. 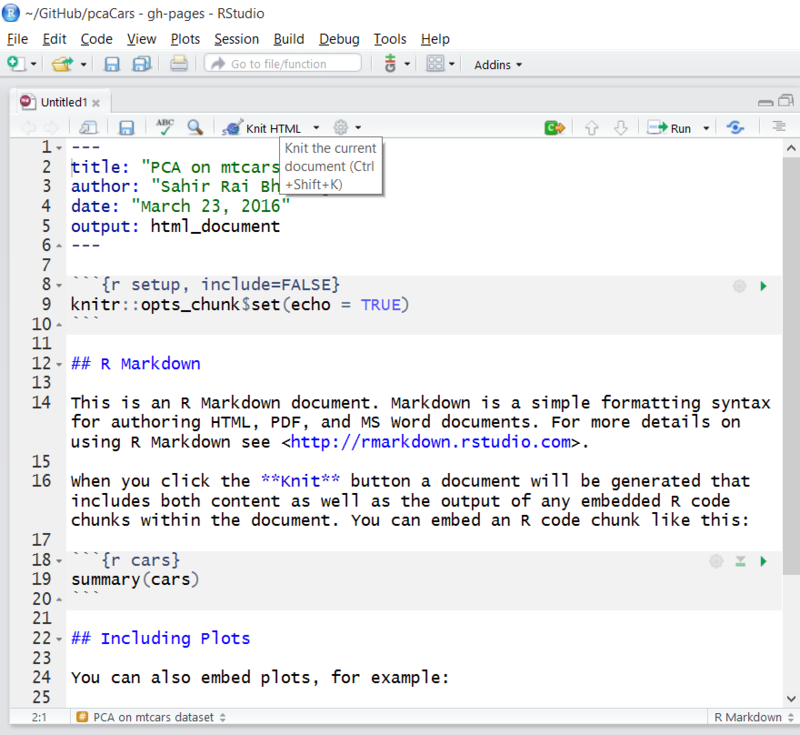 RStudio also has the ability to interact with Git and GitHub, similar to GitHub Desktop. 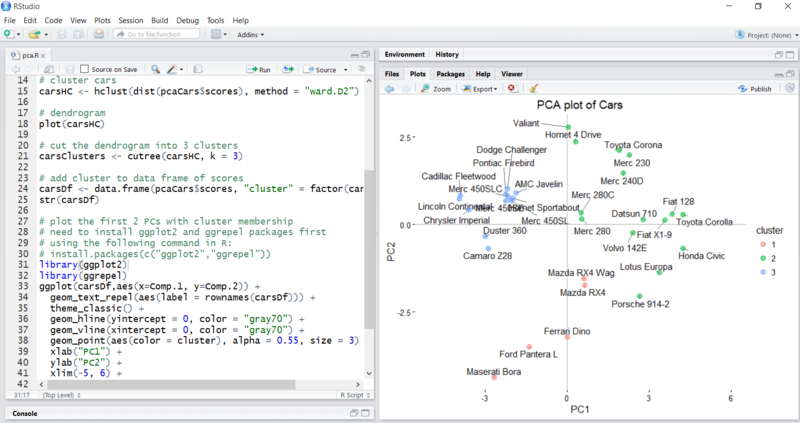 I will briefly show how to initiate this by creating an RStudio project. More comprehensive resources can be found here and here. 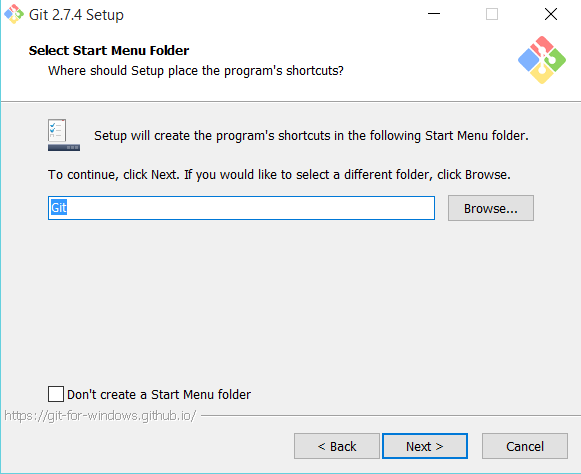 Choose the second option: Existing Directory and select the folder which contains the pcaCars repository. 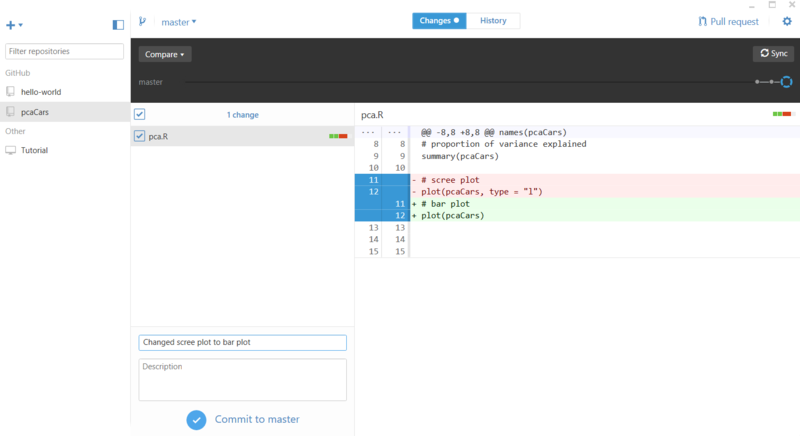 Notice the Git tab in located in the top right panel. It is empty because no changes have been made to the repositor. Add the names of these files in the .gitignore text file as shown in the screenshot below and save the file. 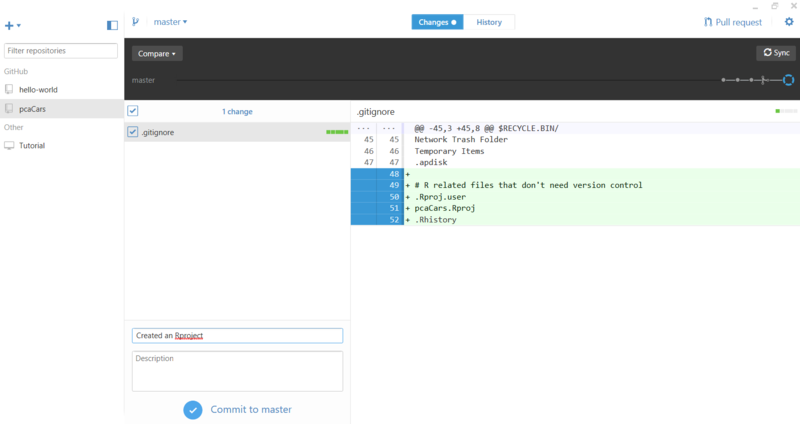 In the Git tab you will now notice the .gitignore file has appeared because you have made changes to it. You will also notice these changes in GitHub Desktop. Describe the commit and click on . 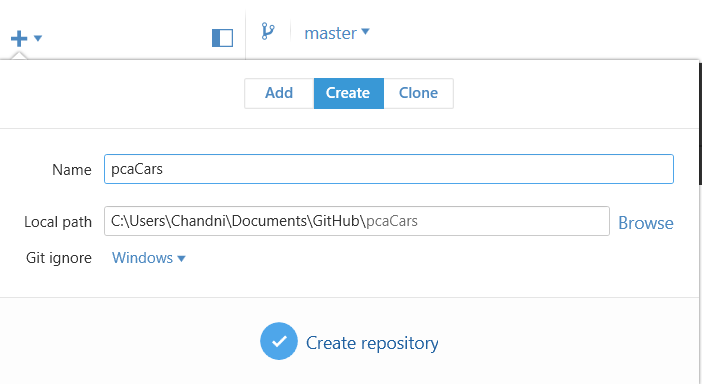 Sync the local repository with the remote by clicking on the button. 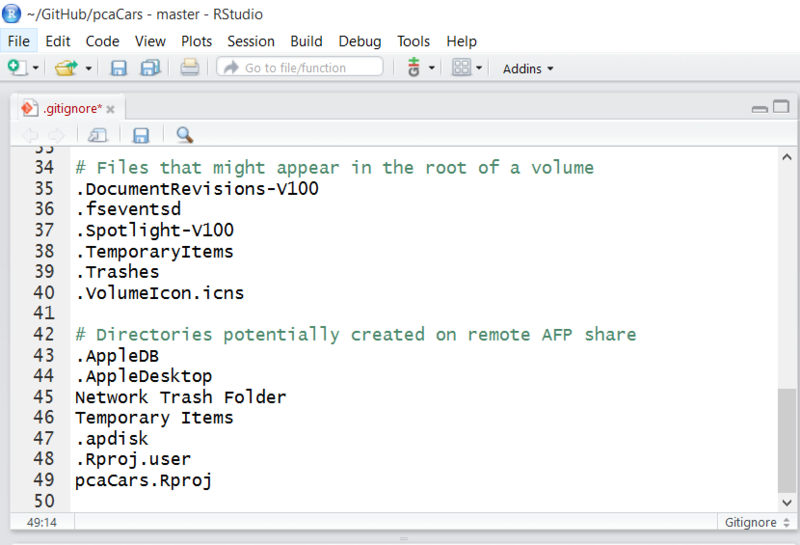 If you don't have the required packages, RStudio will automatically install them. Click Yes. 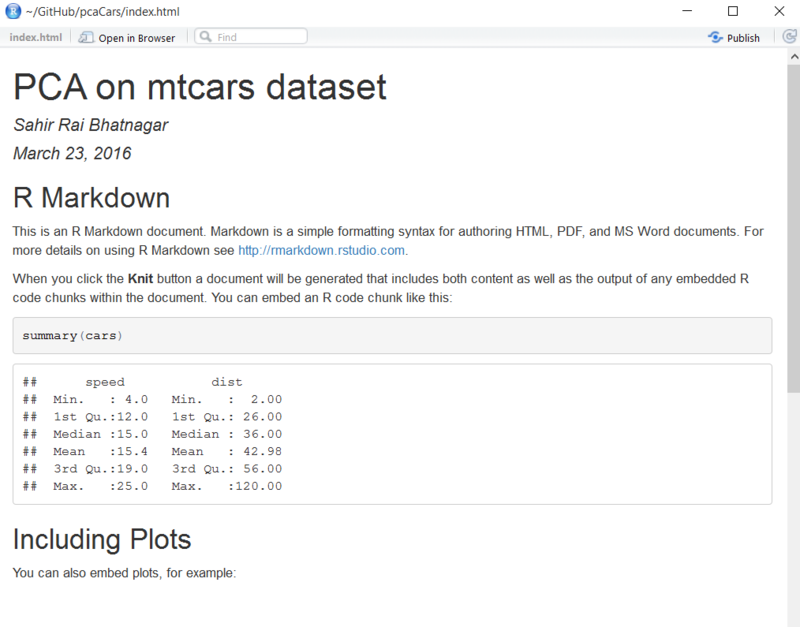 This screen appears to indicate the installation of required packages to use R Markdown. Enter a title and author. Ensure that the Default Output Format is HTML. Click on OK.
To ensure everything is working correctly compile the document by clicking on the button. 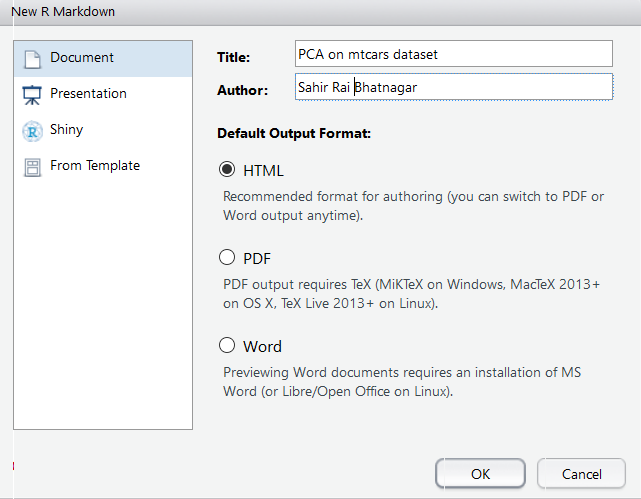 This will convert the R Markdown document to HTML. If everything is working properly, an HTML document named index.html will appear. This is the HTML report, also called a dynamic document that contains both R code and text. I have created a sample report which you can see here. Copy the contents of that report and paste it into the index.Rmd file, replacing its entire contents. Click on the button. The HTML document will automatically load after the document has finished compiling. You can view this document in your web browser by clicking the Open in Browser button. Note the location and filename of the document. It is currently only on your computer, and has not been published online. 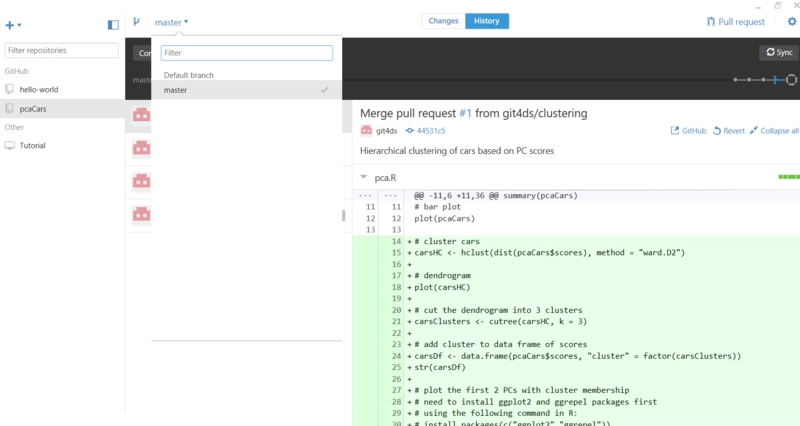 Both RStudio and GitHub Desktop have noticed the changes you made to the gh-pages branch. 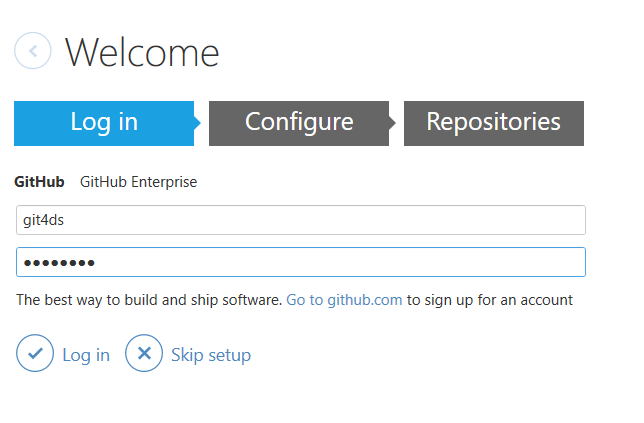 Publish the local changes to your online GitHub repository by clicking the button in GitHub Desktop. 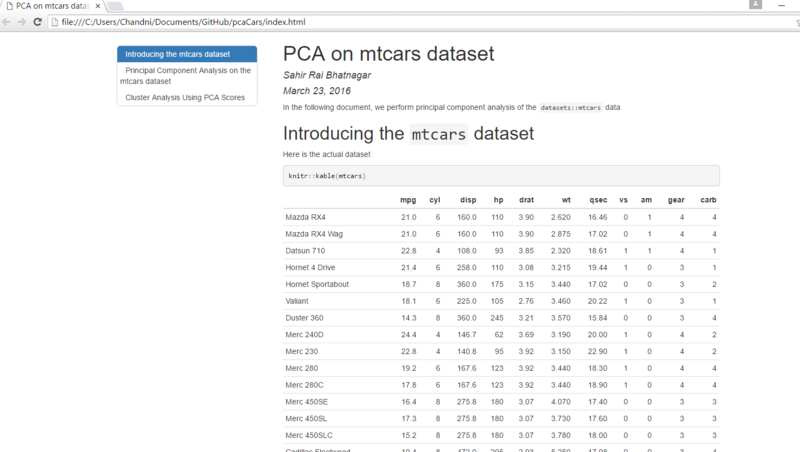 Head over to the pcaCars repository in your online GitHub account. 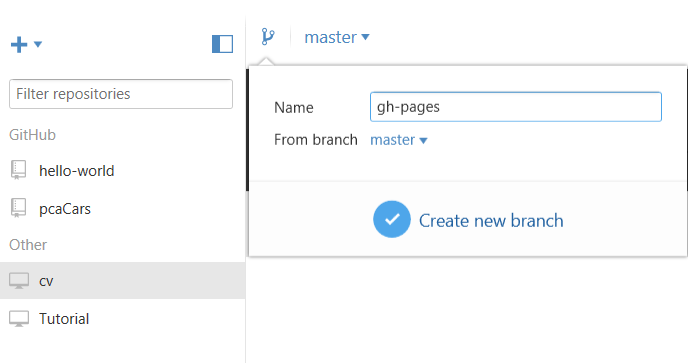 Click on the Branch dropdown list and select the gh-pages branch. Notice that the R Markdown, HTML and related files only appear in the gh-pages branch because that where you committed them. Click on the Settings tab. 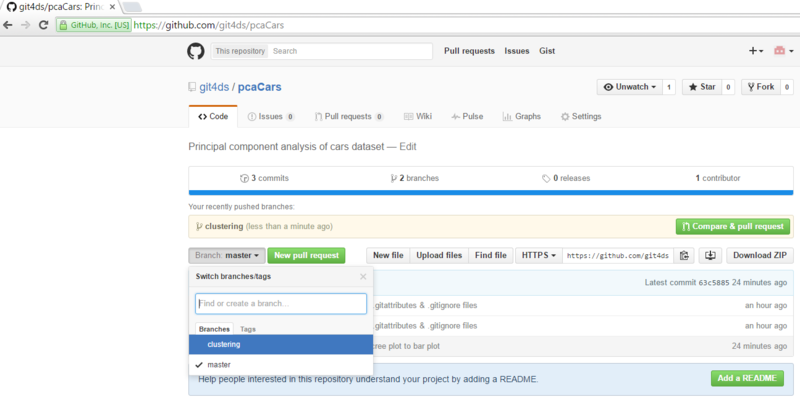 You will see a box called GitHub Pages which says that your site has been published at http://username.github.io/pcaCars. Click on the site to verify that the report has indeed been published online. Well done. The report has been published online. This makes it extremely easy to send reports to your supervisor or collaborators, without having to send large email attachments with long names indicating the version. 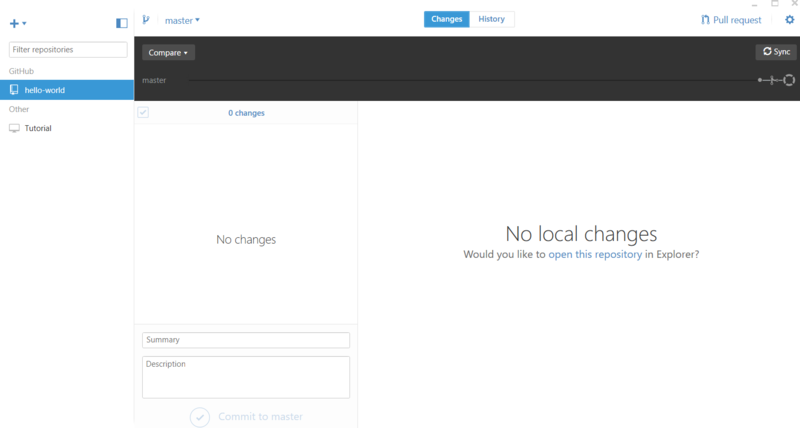 Simply commit new changes to the repository, and the report will automatically get updated online. The website link never changes, and you can simply send an email to your supervisor or collaborators indicating that changes have been made to the document. The html document that you want to publish must be on the gh-pages branch. See https://pages.github.com/ for more details. Every repository you create can have its own website. Let's test this in Chapter 8. In this chapter you will learn how to create an online CV. The template I have shown is for illustration purposes. The main objective here is for you to have a website that has your CV. I highly recommend the advice given by Sherri Rose on Academic CVs for Statistical Science Faculty Positions. Save the template CV in the newly created cv repository on your computer (source). 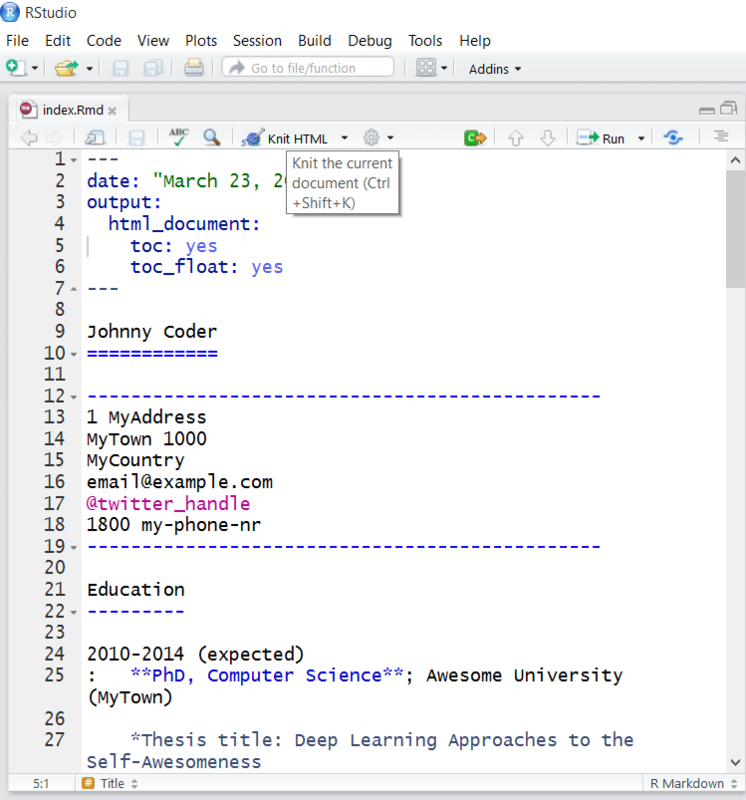 Open the file in RStudio and click on the button. 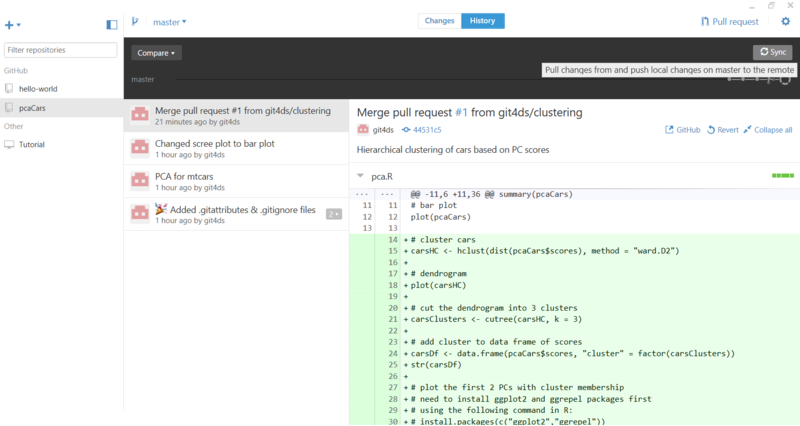 Commit the changes in GitHub Desktop. Describe the changes you made and click on . 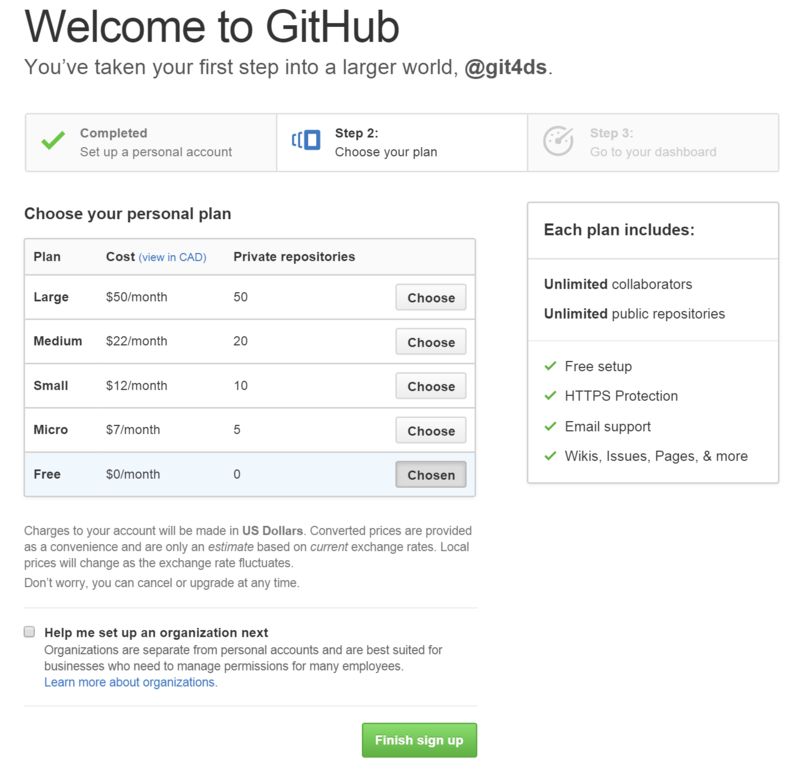 Click on to push your changes to your online GitHub account. After entering a description of the repository click on . Your GitHub Desktop should now be clean. In setting you should see that your site has been published. Well done. 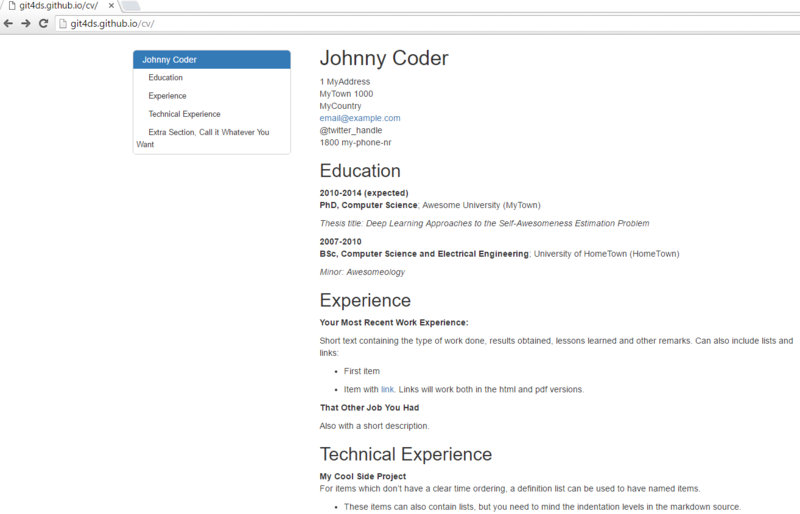 You now have an online CV. This concludes the tutorial. Well done. 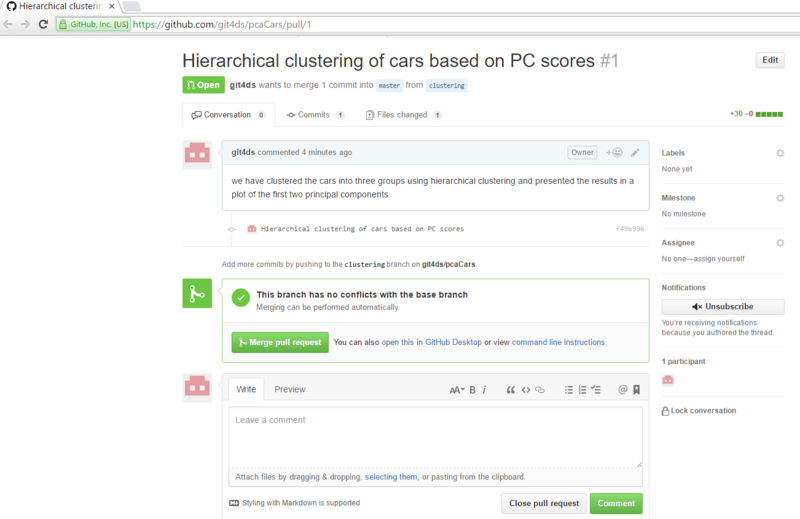 GitHub has evolved into a necessary tool for anyone doing data analysis. 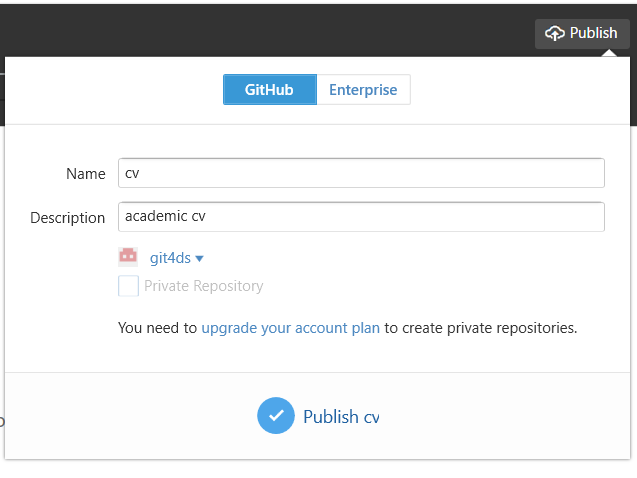 It is not uncommon now for employers to prioritize your GitHub portfolio over your CV. 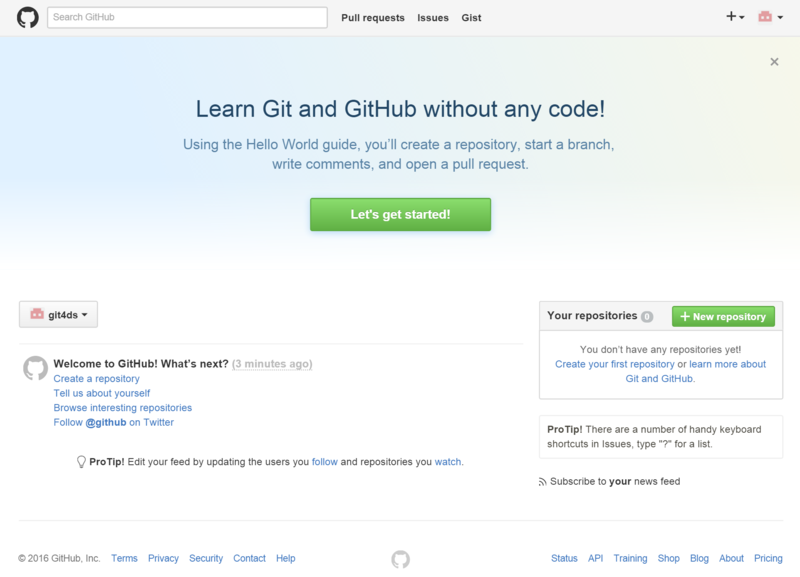 This tutorial demonstrates how simple it is to get up and running with GitHub. In addition to having an easy-to-use interface, it allows you to easily create websites and host dynamic documents. I encourage you to adopt this workflow, whether you work in industry or academia, to showcase your work, increase efficiency and ensure reproducibility.